School is starting again tomorrow for my son. It's been lovely summer holidays that we spent in the Dubai heat, in Germany and in Portugal. It's been long too, about 10 weeks. But by no way boring. My kids come to an age where they play more and more sophisticated games. It lies in the genes of my family that we love to play card and board games. I can confirm that for at least 5 generations - my great-grandmother used to love playing and my children seem to be have the same bug. So even the month that we spent in the Dubai summer heat, didn't feel long at all as we were always busy. Tomorrow morning at 6.30am the alarm clock will ring, and I will have to prepare breakfast for a sleepy family and lunch boxes to be taken to school. I have to come up with a few new lunch box ideas, as I was informed by the teacher that at mid-morning break, kids are only allowed a piece of fruit or a cereal bar. I must admit, I find that a tad too little. 6 and 7 year old kids having just that between breakfast at 6.30am and lunch after 12pm? When it comes to gluten/grain free flours, I am left with coconut flour and chickpea flour as almond meal is out of the picture. This Lemon Coconut Loaf has become a staple over the summer. It's light and fresh, sweetened with banana and honey. The batter is good enough to make either muffins or a loaf out of it. A good solution for the lunch box that the kids will enjoy. I am sure the rest will fall into place as soon as school starts. Preheat oven to 180C/375F. Grease or line small loaf pan. Alternatively grease or line six muffin molds. In a bowl, sift together coconut and flour and baking soda. Set aside. In another bowl, lightly beat the eggs. Stir in coconut oil, honey and mashed banana until well combined. Add lemon zest and lemon juice. Combine wet and dry ingredients. Make sure the batter is lump free. Spoon batter into loaf pan or muffins molds. 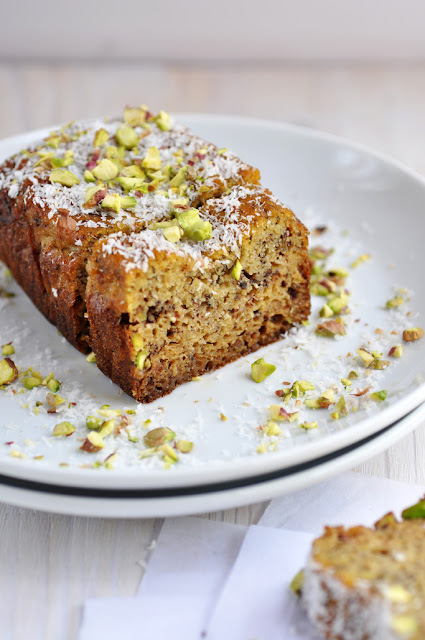 Sprinkle with some chopped pistachios and coconut. Bake for about 25 minutes (muffins) to 35 minutes (loaf), or until tester comes out clean.